Sarah Crichton Books, 9780374280802, 400pp. "Words by the millions have been printed about you, but none have revealed your real life, your secret life--which is that you belong to me." 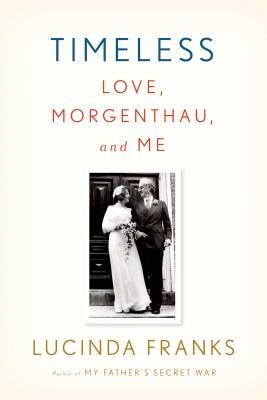 In this beautifully rendered literary memoir, Lucinda Franks, a Pulitzer Prize-winning journalist, tells the intimate story of her marriage to Manhattan District Attorney Robert Morgenthau, one of the great men of our time. After Lucinda interviewed Bob for The New York Times in 1973, the two took a while to understand that they had fallen in love. Franks was a self-styled radical who marched with protesters and chained herself to fences. Morgenthau was a famous lawyer, a symbol of the establishment, who could have helped put her in jail. She was twenty-six. He was fifty-three. Now, thirty-six years into a marriage that was never supposed to happen, one between two people as deeply in love as they are different, they are living proof that opposites can forge an unbreakable life bond. In Timeless, Franks offers a confidential tour of their unconventional years together, years that are both hilarious and interlaced with suspense. At the same time, she takes us behind the scenes to reveal the untold stories behind some of Morgenthau's most famous cases, many of which she helped him brainstorm for. A compelling memoir with piercing insights into how a relationship grows and develops over a lifetime, Timeless grants us an enlightening window into one of New York's most famous yet defiant and iconoclastic couples, and the trials and successes of their union. Lucinda Franks is the author of a memoir, My Father’s Secret War. A former staff writer for The New York Times, she has also written for The New Yorker, The New York Times Magazine, and The Atlantic. She won a Pulitzer Prize for her reporting on the life and death of Diana Oughton, a member of the Weathermen. A graduate of Vassar College, Franks lives in New York City with her husband, the former longtime district attorney for New York County Robert M. Morgenthau.